Devil’s Claw is cultivated in the Kalahari without the use of artificial fertilisers, insecticides or fungicides. It can be used for joint pain and to reduce symptoms of back pain or otherrheumatism pains in the shoulders and elbows, or for knee and other joint pains. 1 film-coated tablet contains 480 mg of extract (as dry extract) from Devil’s claw root (Harpagophytum procumbens D.C. and/or H. zeyheri L. Decne.) (1.5-3.0:1). Extraction solvent: Ethanol 60% V/V. The other ingredients used for the tablet are lactose, maize starch, microcrystalline cellulose, precipitated silica, colloidal silica and magnesium stearate (vegetable source). The tablet coating contains talc, titanium dioxide, macrogol and hypromellose. Adults and the elderly: Take one tablet twice daily immediately after food. The dose can be increased to two tablets twice daily if relief is not obtained after 3 to 5 days. 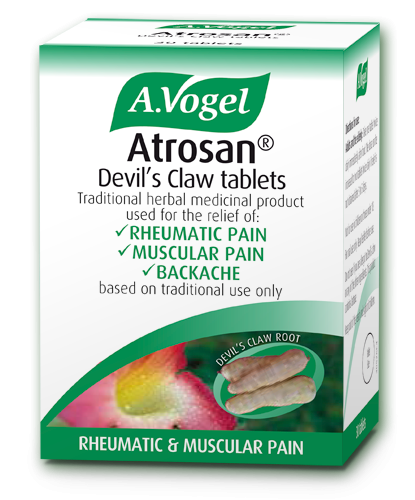 Do not use if you are allergic to Devil’s claw or any of the other ingredients. This product contains lactose. If there is any doubt as to the nature of the problem please consult your Doctor for a diagnosis. Do not use when pregnant or breastfeeding unless under the supervision of a Healthcare Professional. Do not use for children under two years of age unless under the supervision of a Healthcare Professional.